Patent Application 20100091161 is for built in phase detect autofocus. Patent Application 20100091184: "The present invention relates to an image processing technique that displays a plurality of still images as smooth movie." Patent Application 20100100276: "The present invention relates to an imaging apparatus and a drive recorder system mounted on a vehicle for imaging and recording a vicinity of the vehicle at an accident." Patent Application 20100097489: "A digital camera includes a communicator that communicates with other digital camera, a receiver that receives a camera information of another digital camera and an imaging device that forms a digital image of an object. The digital camera further includes a processor that creates a digital image data from the digital image based upon the camera information." "Recently importance has been placed on the portability of digital still cameras, and zoom lenses, which are imaging lenses, have been decreasing in size and weight, so that the main body of the camera can be smaller, thinner and lighter. 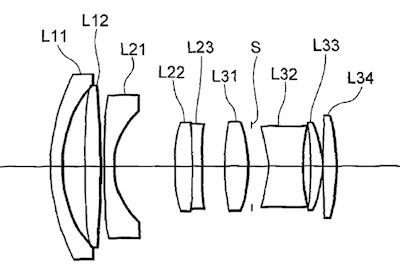 In the case of a conventional zoom lens, however, the air space between each lens group is effectively changed upon zooming from the wide angle end state to the telephone end state, so as to contribute to downsizing"
Patent 7656591 is for a 40mm f/2.8 lens with a wide angle of view of 72 degrees. The patent was filed in 2007 and granted in 2010. Very curious what Nikon had in mind with that lens. "A camera according to a first aspect of the present invention includes: a display device capable of displaying on a single screen a plurality of images, each of which can be observed from one of a plurality of directions"